Have you got my best side? That's every side. 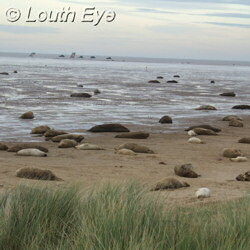 The grey seal pup pictured top left is probably the first of the 2012 season at Donna Nook Nature Reserve. 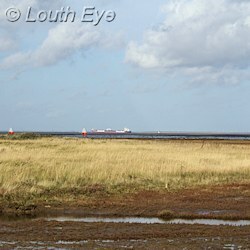 It was born around the 12th of October at the seal colony, which is also an RAF bombing range. It's not a very clear picture, partly because the zoom on my camera isn't all that powerful but also because we had to keep our distance to avoid upsetting the seals. 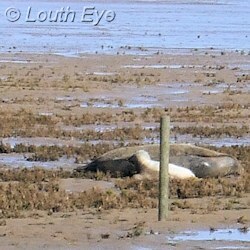 October is almost too early to visit, since there were only four seals on the shore when we went. The volunteer warden we spoke to was a mine of useful information. She told us the pups are only with their mothers for 17 days, after which they're told to get on their bikes and find proper jobs. Strangely the seals aren't all that concerned about the bombing and live firing that goes on throughout the year on the range. There's a big red flag up when this is going on, as well as a plethora of buoys and warning signs about the dangers of unexploded ordnance. 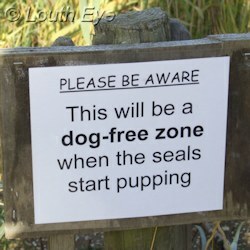 However they can be disturbed by the thousands of visitors who come to watch them, or by dogs, which are forbidden during the pupping season. That peaks during November and December. 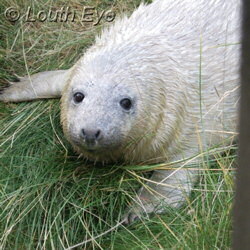 1435 pups were born in 2011, and when they are all on the beach it's much easier to see what they're up to. People are supposed to stay behind a fence, so it can get quite crowded if you visit on the weekend. 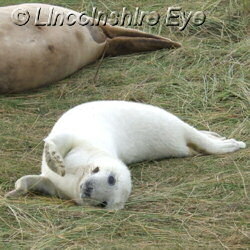 Donna Nook is just down the road from the Ark Animal Rescue, on Donna Nook Road. They always need pet bedding, old blankets, cat food, and other pet supplies. So if you're thinking of visiting the nature reserve and you have anything they could use, or you could give a pet a good home, it's worth making the detour.